When building the ST-35 for the article “High Performance Power Supply Modifications to an ST-35”, I used an external switching DC power supply for the heaters to reduce the heat generated by the not-well ventilated power transformer. Since the heaters draw 25% of the power consumed by the amplifier, adding an external supply causes a noticeable drop in transformer temperature. Using DC to supply the heaters of a power amplifier makes little difference in the “hum” output but reducing the amount of AC wiring under the chassis doesn’t hurt, and it allows greater latitude with heater wiring placement. Controlled warm-up time may increase tube life. Additionally, highly stable heater voltage is always a desirable goal with any tube circuit. The simple circuit described below has a basic parts cost of less than $20. This includes the switching power supply, but not hardware items, such as an enclosure and connectors. For my current ST-35 project, I decided to forgo modifying a PC power supply and start with a new, off-the-shelf supply. Checking vendors’ websites shows that Mean Well has a variety of suitable inexpensive switching supplies. I obtained both an EPS-45-7.5, and an MPS-45-7.5 for testing. The specs on the MPS-45 showed that the voltage adjustment range came closer to the desired 6.3 VDC for heaters, and that it additionally meets requirements for medical use. Closer examination, however, led me to believe that it’s based on their less expensive PS-45 unit which is larger, less efficient, switches at a lower frequency closer to the audio range, and is probably an older design. Minor changes are made to meet more stringent medical equipment insulation and isolation requirements. Confining the initial testing to the EPS-45, six 9-pin miniature tube sockets were mounted on a test jig, and wired per the Dynaco ST-35 schematic. After connecting the AC input, DC output wiring, and a voltmeter, the supply was powered on to adjust the voltage. Tube heaters have very low resistance when cold, drawing considerable starting current. Some quick measurements and calculations showed that the tube compliment of the ST-35 initially draws 26 amps at 6.3 volts. After warm-up, these same heaters draw 3.64 amps or 23 watts. The maximum surge current rating for this 40 watt supply is 6.6 amps. The test jig was rewired in a series-parallel configuration for 12.6 volt operation. This doubles the cold starting resistance, and lowers the starting current requirement to 13 amps. Each pair of EL84 output tube heaters is now wired in series, and their respective 12DW7/7247 has the 12 volt heater leads connected to pins 4 and 5, with no connection at pin 9. The two completed channels are then wired in parallel. Another supply of the same type was ordered, an EPS-65-12 (at right), rated for 12 VDC output at 65 watts versus 40 watts for the EPS-45-7.5. I was pleased to find that they are very similar, being the same physical size, and even more pleased to find that the 65 watt 12 VDC unit is less expensive. While my larger computer power supply can handle this starting current, even the larger EPS-65-12 obviously will not. This time though, I found that the supply actually will start, but the built in current limiter shuts down the supply 3-5 times until finally enough heat and resistance is retained in the heaters to allow continuous operation. Convinced that for predictable operation, a current limiting circuit would be necessary, I devised one using a 20 watt series resistor, a relay with a driver transistor, and an R/C delay circuit. While this worked well, my friend Steve Lafferty suggested the much simpler circuit (below) using only two active devices and two resistors. It proved to be equally effective, but with fewer parts and at lower cost. I adjusted the output to 12.600 VDC and watched the voltmeter. After 15 minutes it required a small adjustment. In another 3 or 4 hours, I made an additional minor “tweak”, and that’s the last time it’s been adjusted, after many hours of running time. The final voltage setting should be measured at the tube sockets to allow for minor losses in the current limiter and wiring. Mean Well specifies an input voltage range of 90-264 VAC. Using a Variac, the input was varied from 80 to 142 VAC, while monitoring the output, and no meaningful change was seen from the 12.600 VDC. The meter’s “thousandth” digit “bobbles” from time to time anyway, but that’s the limit of its resolution. Switching power supplies have a bad reputation for noise. This is because they chop-up the AC sine wave into a harmonic-rich square wave, send it through a transformer at a high frequency, then rectify the transformer output, adding additional diode noise “spikes” into the mix. The maximum ripple and noise output of the supply is specified at 120 mVpp My initial noise reading was 62 mVpp on spikes. Mean Well specifies the reading be taken at the end of one foot of twisted wire with both a 0.1 and 47 mfd. capacitor across the line. Twisted wire was being used, so I added the capacitors but found no improvement. Somewhat by accident, I discovered that the one foot of wire needs to be placed so that the wire end, where the oscilloscope probe is attached, is physically one foot away from the supply itself. It seems that the sensitive probe can pickup more noise through the air directly from the transformer, than from the output wiring! Doing this and installing the metal case cover reduced the peak noise on spikes to about 30 mV. Adding the recommended capacitors further reduced the maximum output noise to 10 mVpp That’s 0.08%, (-62dB) on spikes, and the average noise is somewhat lower! Measurements show that the supply runs at 90 kHz. 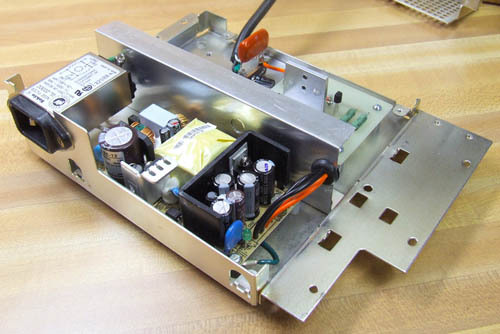 Switching power supplies are hazardous devices, since the AC line is directly connected to primary side components. Additionally the AC line voltage is raised to hundreds of volts in the primary. The large capacitor with the product label is rated at 400 volts! DO NOT consider powering up an exposed supply without using an isolation transformer in the AC supply. Don’t be fooled by the small size. Even with an isolation transformer, potentially LETHAL current and voltage is present! After disconnecting the AC source, allow time for the primary capacitor to discharge. The supply must be wired for “3 Wire” AC input. For both noise and safety considerations, DO NOT operate the supply with a “2 Wire” AC input. The power supply should be mounted in an enclosed but ventilated metal case for both noise and safety reasons. The listed ef­fi­cien­cy of the supply is 86%, so little heat is generated. Normally a cooling fan will not be necessary. I had an old supply used for powering external computer drives, and its en­clo­sure worked well for me (right). I be­lieve that an old computer power supply case is perhaps the best source of an en­clo­sure for this project. I also have a Mini-ATX (SFX) case that appears to be about the right size and a FLEX-ATX case would also be a good size. Thousands of PCs are discarded every year, and old power supplies are plentiful. 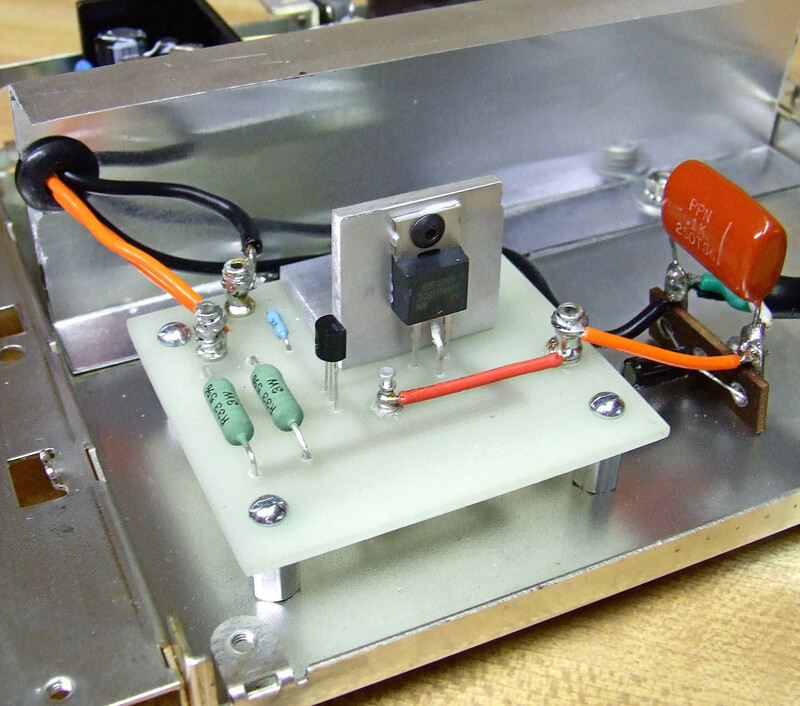 After removing the existing circuitry, the case was measured and drilled to mount the power supply and current limiter board on short stand-offs. I also fabricated a separator from light aluminum sheet, hand bending the top and bottom flanges under a straightedge. Computer power supply cases usually have a C14 power inlet included in the case, allowing the use of a standard IEC power cord. My case had one with an RFI filter included, so it was reused. The power supply has input filtering, but an additional filter is worthwhile. In this application, its purpose isn’t to filter the incoming AC as much as it is to reduce outgoing noise into the AC line. The filters work equally well in either direction. If you don’t have one, they are often available at surplus electronics dealers at low cost. The power supply has separate ground connections located at two mounting holes on one side of the board. Both must be grounded, or output noise will be increased. I used ring terminals with a wire for attaching both board ground connections and the AC ground to a single common point on the chassis. No other ground connections are needed on the power supply side or DC output side. There are only four components in the basic limiter circuit (schematic at right), so it could be built numerous ways. I did a PCB layout (next image down) and etched the single-sided board at home. 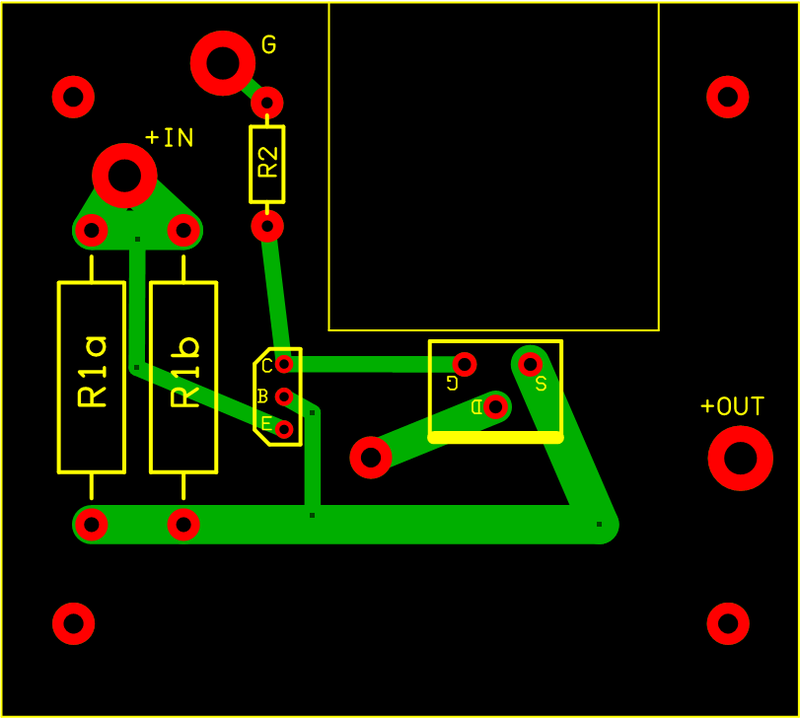 Click the following links for a download of the PCB layout files (they’re small). The .PCB file is for ExpressPCB and the .RRB file is for Copper Connection. The limiter circuit could also be built on perfboard or even on a couple terminal strips. The sche­ma­tic shows the limiter components, as well as an optional LED and the filter capacitors. I chose not to mount the capacitors on the board, but on a separate terminal strip, allowing the use of components that were on hand. My indicator LED is mounted on the case cover. The completed current limiter board is shown below right. R1: Sets the limiting current of the circuit. The board layouts show mounting for two resistors in parallel. This was done to ex­per­i­ment and determine the effects of various resistor values. A value of 0.12 ohms allows consistent starts and has little effect on warm-up time. However it delivers 5.7 amps, which is the short term maximum current available from the power supply. Two par­al­lel 0.33 ohm resistors as shown (or 0.165 ohms), passes 4.25 amps, and roughly doubles the normal heater warm-up time. A single 0.15 ohm resistor (an E24 value) passes 4.7 amps, and is a good compromise. RF4905 P-Channel MOSFET: This will generate considerable heat when limiting current, although nearly none after that, so it should be mounted on a fairly thick heatsink. I used a piece of 1” X 1” X 1” aluminum channel, as seen in the picture. A smaller heat­sink could be used, depending on the de­sired warm-up time, and current drawn. Output Wiring and Amplifier Connector: I cut the ends off an 18 AWG, IEC (com­put­er) power cord, and attached it to the terminal strip mounting the filter capacitors. I will be using about 18” of wire, but IEC cords are readily available in 16 and 14 AWG for longer distances. My connection to the power amplifier will be via a Speakon NL4FC plug and compatible NL4MP chassis jack (below). This locking assembly is well suited for this purpose, but of course there are many other connectors that can be used. This project was built with a specific use in mind, but the concept is applicable to other vacuum tube circuits. As described above, heater warm-up time is easily variable by changing R1. Switching power supplies are manufactured in a wide variety of current ratings, for other requirements. I’m sorry that I did not reply to your inquiry. It appears that my email supplier has some issues. I likewise appreciate your comments, and thank Steve for answering your question. In the last paragraph of the article I noted that this is applicable to other current requirements, not just my particular needs. The limiter circuit shown will work for lower current loads, down to the point where the limiter circuit becomes completely unnecessary. Likewise, exactly as shown, it should be applicable to at least double the current draw, although the necessary warm-up time may become quite long without a larger SMPS. In both situations, adjustments to the R1 value will be needed. I’d guess the LM338 probably will work at the current load that I showed, although with the inefficiencies that Steve mentioned. One of the main factors considered in the selection of the IRF4905 was it's very low "on" resistance. A SMPS rated at higher output voltage would be necessary to accommodate the drop-out voltage of the LM338. Keep in mind that as the current through the LM338 increases, the drop out voltage also increases, and at a high current level, the dropout voltage will change somewhat with temperature. This might be particularly undesirable with tube heaters, where it could be difficult to detect. Hey Jack, Your post was forwarded to Art. I guess he can't reply right now so I'll try to help. First, thank you for the kind words about his article. Looking at using the LM338 as a current limiter, the only concern I would have is with the voltage drop across it and the resulting power dissipation. Art mentioned 3.64A steady-state current for the 6.3V heater wiring so I will estimate 1.82A for the 12.6V configuration. Then the mosfet current limiter drops about 1.82 x (0.15+0.02) = 0.31V after warmup and power dissipation is Pdiss = 1.82 x 0.31 = 0.56W. The current limit of the mosfet circuit should be about 4.7A so the LM338 would need a sampling resistor of 1.2/4.7 = 0.255Ω; to get the same limit. Its dropout voltage is about 2.0V at 1.82A. Thus, its total drop is (2.0 + 0.255 x 1.82) = 2.46V after warmup and Pdiss = 1.82 x 2.46 = 4.48W. It's best to have negligible voltage drop to achieve the 12.6V output with the 12V-rated supply and of course minimum power dissipation is nice. While the LM338 might not be a good fit here, it could be quite useful in a less demanding application. Anyway, thank you for the suggestion and your post is most appreciated. Thanks for the excellent article, this answered a few questions I've had recently about using a SMPS. One thing - did you consider using a LM338 for the current limiter? It's good for 5A continuous, and it only requires one external resistor to set the current.